Software External Behavior under Refactoring ? 最近在上柯泰德老師的短期英文編修訓練課程, 邊上就在想一些有的沒的. 最初的三週課程在說明基本的編修原則, 舉很多例子說明. 而其中有很大一部份, 例如精確寫作 (Write for Conciseness) 以及明白寫作 ( Write for Clarity ) 兩大項目中的一些原則, 功用在於不破壞原本要表達的意義下, 讓文句更通順易讀, 同時避免因為一些混淆不清的寫法, 錯誤的時態, 導致讀者誤解了要表達的原意. 這讓我想到 Refactroing. 雖然不是說兩者是一樣的, 但是如果把 Paper 內容當作 Source Code, 的卻有很多相似的地方. 同時柯泰德老師也提到在他的網站上, 蒐集了很多台灣人寫 Paper 常犯的錯誤模式, 建議我們有空可以多看, 並嘗試練習修改, 平日寫 Paper 就比較容易發現不順的地方. 因此很正常地我就想, 如果有一個 Paper Bad Smell Detection Tool 不是很好嗎 ? 邊寫 Paper, 就會自動根據常見的錯誤模式, 提醒我可能要多加修改的地方. 如上圖, Bad Smell Pattern Repository 用來存放常見的 Paper Bad Smells, 亦即常見的錯誤撰寫模式. 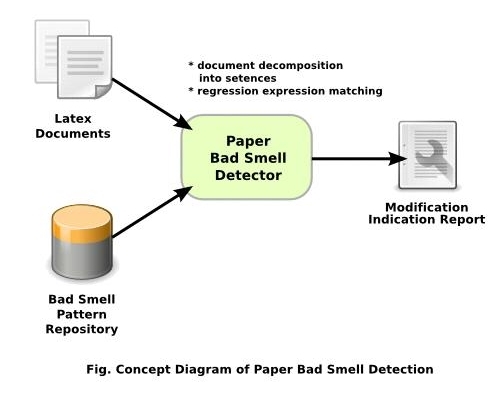 而 Paper Bad Smell Detector 首先對於輸入的 Latex Document 進行拆解,　可能是以單句為單位拆開. 然後將每一句利用 Regular Expression 與 Paper Bad Smells 進行比對, 辨認出可能需要修改的地方. 最後責成修改指引報告 ( Modification Indication Report ), 給 Paper 撰寫者作為參考. 最終的修改決定權還是在於撰寫者, 畢竟此 Tool 不可能猜測撰寫者的原意, 只能根據編修的累積知識給予建議. This entry was posted on 上午11:08 and is filed under idea , Refactoring , research . You can follow any responses to this entry through the RSS 2.0 feed. You can leave a response, or trackback from your own site.